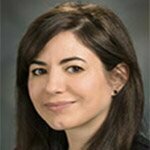 Dr. Rivka Colen joined the Department of Diagnostic Radiology at the University of Texas MD Anderson Cancer Center in 2012. She specializes in quantitative imaging analysis/biomarkers and clinical, translational and preclinical imaging genomics, radiomics, big data and image guided therapy in brain tumors. Dr. Colen has pioneered the field of imaging genomics in brain tumors and published the first paper on quantitative imaging genomics. She spearheads the Cancer Genomic Atlas (TCGA) Imaging- Genomic projects which discovers and correlated genes and microRNA in brain tumors with MR imaging (termed imaging genomics or radiogenomics). She has received numerous funding and awards for her work in this field, including the Siemens Outstanding Research Award/Grant, ASNR research grant, and RSNA research fellow grant. Dr. Colen’s interests are the use of imaging, specifically MRI, for genomic target discovery and identification, development and validation of imaging genomic biomarkers, and developing imaging genomic predictive models/biomarker signatures using numerous computational and functional analysis biostatistical models. She performs research in novel neurointerventional diagnostic and therapeutic modalities and the application of MR imaging. She is intimately involved in intraoperative MRI in neurosurgery and MR guided focused ultrasound ablation of brain tumors and targeted drug delivery. Dr. Colen serves as the chair of the American Society of Neuroradiology Imaging Genomics Working Group, and is also the co-director of the Quantitative Imaging Analysis Core at MDACC as well as the lead principal investigator of the TCGA Glioma Research Phenotype Group at MDACC.